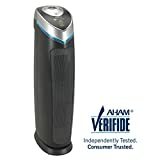 GermGuardian - AC5000E: Air Purifier Review • The Air Geeks, reviews of air conditioners, dehumidifiers and air purifiers. Here we are, reviewing one of the major best sellers in the air purifying segment. Guardian Technologies, with its GermGuardian AC5000E, has made a lot of customers happy in the past. The AC5000E is a 3-in-1 air purifier that is optimized to ensure that your room gets clean, fresh, and pure air. As many competitors, it utilizes the highly effective “true HEPA filtration” mechanism to remove airborne particles from the air that goes through it, in addition to UV-C light technology to eliminate various airborne microorganisms. Lastly, it features an odor filtration mechanism that reduces bad smell from the air. Silent, effective, elegant : is the AC5000E worthy of its reputation and sales figure? Let us put it to the test. First, the specs. The AC5000E is a 3-in-1 air purifier that utilizes a multiple-level filtration process to remove allergens, microorganisms, mold spores, and bad smell from the air. This powerful system is ideal for large rooms and offers an impressive CADR value of 125+. Its HEPA filter is very efficient against allergies and asthma. HEPA technology is one of the most effective filtration mechanism used in air purification. The AC5000E utilizes the true HEPA filtration mechanism to ensure that a great percentage of pollutants are removed from the air that goes through it. As true HEPA filter is capable of removing 99.97% of contaminants, there is real commitment to the freshness of the air inside your home. In addition, this highly effective technology can remove airborne particles that are as tiny as 0.3 microns. The AC5000E is suitable for trapping debris, dust mites, plant pollens, mold spores, pet dander, and more. UV-C lights eliminates potential disease-transmitting bacteria. UV-C light is a highly effective sanitizer. It finds uses in many medical applications. The AC5000E utilizes UV-C light to eliminate disease causing micro-organisms such as viruses and bacteria. This air purifier eliminates viruses and bacteria by damaging their DNA. You should not allow airborne microorganisms to use your room as their breeding ground. Choose to eliminate them by getting an air purifier that destroys them and makes sure that the air in your room is clean and pure. Its charcoal filter remove odors efficiently. Pets and daily house activities (cooking, ironing, etc.) are a common source of odor. This air purifier features an activated carbon filtration mechanism that removes bad smell from the air that goes through it. This charcoal filter ensures that the air in your room is fresh and free from bad smell. You don’t need to kick your pets out of your house. This unit will ensure that any smell that comes from your cats and dogs is trapped before it reaches your nostrils. Cooking and smoking can also affect the freshness of the air in your rooms and make some members of your family feel uncomfortable. The AC5000E is optimized to ensure that the air in you room remains fresh at all times. Some air purifiers are noisy and they are therefore not suitable for bedrooms and other rooms where quietness is desired. This air cleaning unit runs very quietly and it is therefore ideal for all rooms including the living room and bedrooms. You will be able to sleep well without any disturbances. Failing to replace the UV-C bulb or the filters at the right time can affect the effectiveness of your air cleaning system. It is easy to forget the replacement dates. This unit features an indicator light that blinks to alert you that you should replace worn out parts with new ones. Replacing these parts helps to enhance the overall effectiveness of your system. It ensures that pollutants will not be able to sneak their way into your nostrils. New units exude a plastic smell for the first few days. Not a major problem, as it disappears after the first week. The UV-C light it features is very bright, which can annoy some users. Highly effective. This unit delivers impressive performance and it is ideal for large and medium rooms. Silent operation. 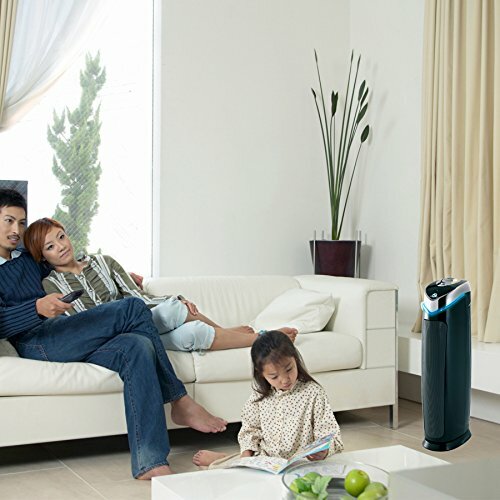 Most users are impressed by the quiet operation of this air purifier. Most users have indicated that it is ideal for bedrooms and other places that require quietness. Plastic odor on new systems. New units will exude plastic smell, which is not expected from a system that is supposed to be removing bad smell from rooms! Luckily, the smell disappears after a few days. Very bright UV-C light. For some users, the unit’s bright light is disturbing. Fortunately, it is easy to cover. Bought one of these a month or so ago locally, and have been so happy with it that I'm here on Amazon buying another one for the second floor. It is extremely effective in purifying the air of dust and odors. It has made a huge difference in my allergies. Looking forward to having one cranking on each floor. The filters are rather expensive, but all HEPAs are." I have 4 cats and put this near their litterbox. I have the Germ Guardian tower raised up off the floor for better circulation. Within 10 minutes of turning it on the air quality was noticeably fresher! I'm going to order one or two more for other areas of the house. Prior to buying this tower model, I have been using the cool looking stainless steel table model of Germ Guardian air sanitizers for years, I have 5 of those throughout the house and basement. I haven't had a cold since I first discovered Germ Guardians, 4 years ago! I have given 3 of them as gifts. I absolutely LOVE them!! My house smells fresh and clean, even with 4 indoor cats. I highly recommend the tower model and the table model. This tower model filters and cleans the air, as well as sanitizing it. The other model I mention here, only sanitizes the air, killing germs and mold spores. Link to the other model follows." The GermGuardian AC5000E is a stylish and efficient air cleaner that is ideal for large rooms. This 3-in-1 unit combines different filtration mechanisms to ensure that various types of pollutants are eliminated before they get to your nostrils. Living up to its hype, the AC5000E is a unit we recommend, for those who can bear the plastic smell it exudes for the first few days. For such a reasonable price, we are impressed!